Tiny Giant #5: Last flight of the sea butterfly. This pteropod, Limacina helicina, is a tiny marine snail that swims using feet that have been modified into wings. Pteropods are often referred to as “sea butterflies”. 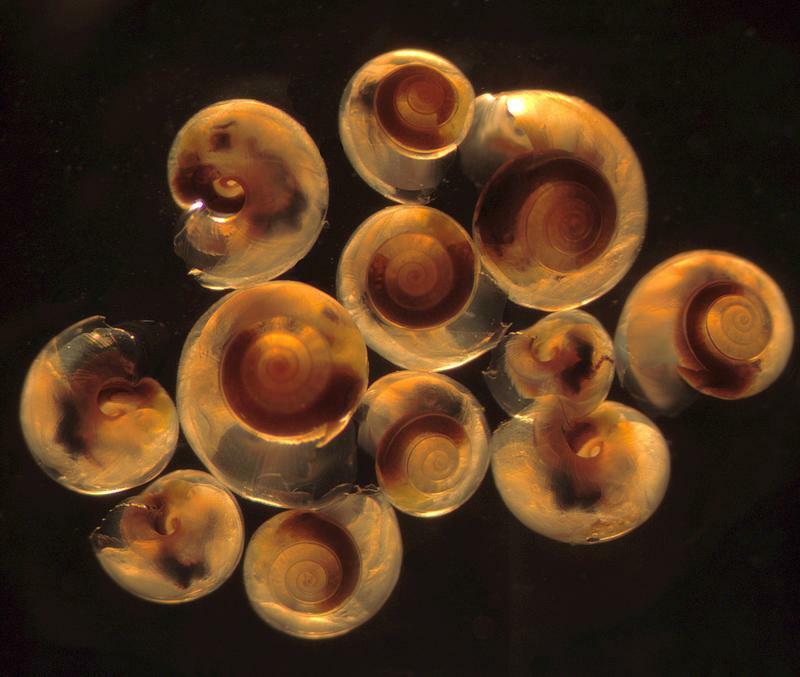 Tiny Giant #1: Foundation of marine food web. Chain-forming diatoms from the genus Thalassiosira often initiate the early spring phytoplankton bloom. Tiny Giant #18: Beauty belies danger. 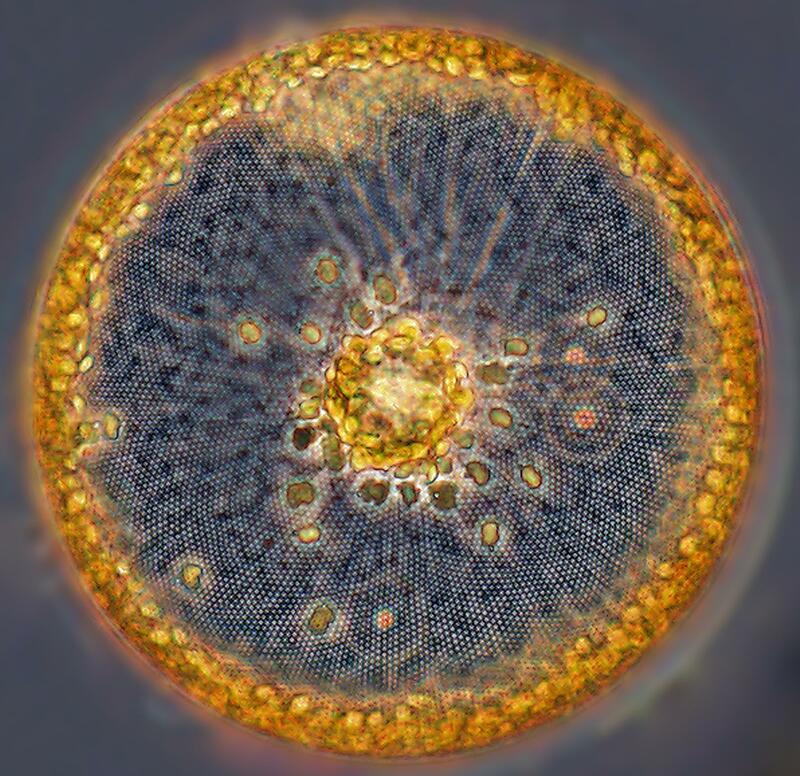 A close-up of the dinoflagellate, Protoceratium reticulatum. 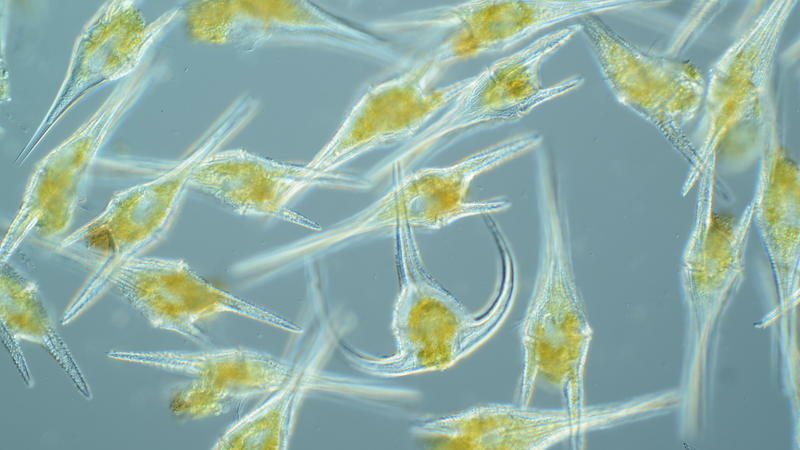 Some dinoflagellates can cause potentially toxic 'harmful algal blooms' or 'red tides'. Tiny Giant #11: Fall harvest. 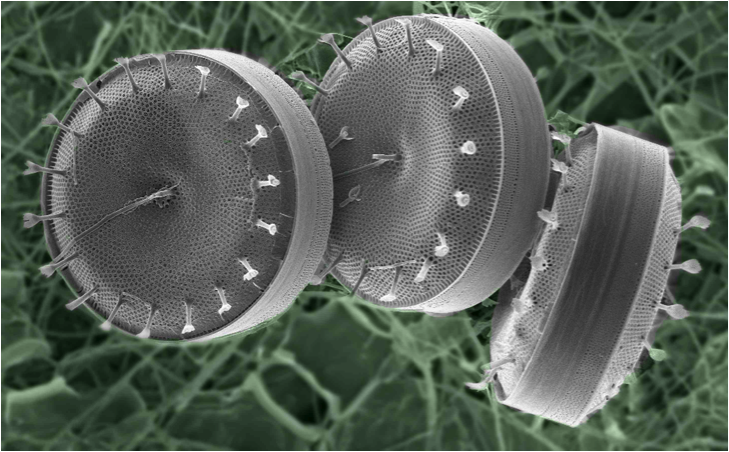 Phytoplankton are microscopic plant-like organisms at the base of marine food webs. 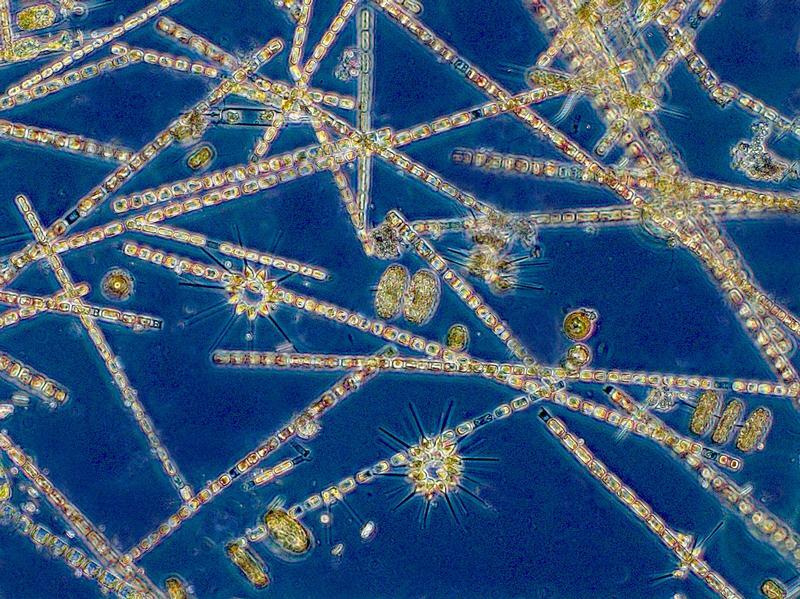 Floating at or near the surface of the sunlit ocean, phytoplankton display thousands of morphological variations. Tiny Giant #3: Bioengineering a solar panel. 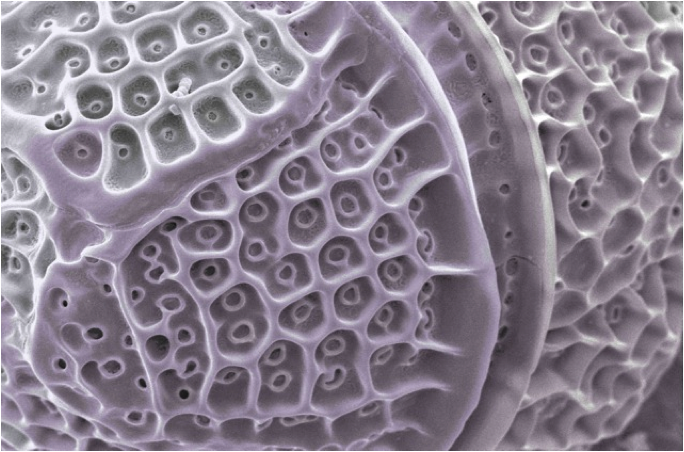 Light-harvesting green chloroplasts are distributed throughout the cylindrical diatom Coscinodiscus. Tiny Giant #8: Summer bloomers. Unlike many dinoflagellates that bloom in spring, Ceratium are summer bloomers. Marine microbes support the entire ocean food chain, provide the oxygen we breathe, and may even help soften the blow of climate change. They're also gorgeous. The exhibit “Tiny Giants: Marine microbes revealed on a grand scale” is a collection of photographs that highlight the surprising beauty of some of the ocean's smallest inhabitants. The photos were taken by scientists at Bigelow Laboratory for Ocean Science in East Boothbay, Maine.